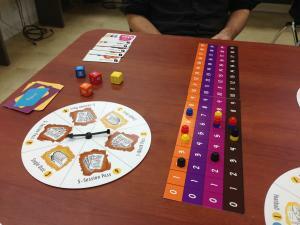 In Fall 2013 Clay Ewing and I went back and did some tweaking to the original Vanity game. Some of the changes were to make the gameplay more user friendly, like eliminating the moles all together and instead using stackers that move along a numbered column to track your fitness, tan, style, and health risk. Other changes were to increase meaningful choice – like whether to take an acting role that earned you Vanity Points but also potentially reduced your attribute levels.